The original structure, an 1880 Italianate Residence with subsequent additions, created a confusing, dark and awkward series of spaces. The Owner’s requirements included updated kitchen and bath facilities, a housekeeper’s suite and spaces to accommodate their growing family. In addition, the Owner desired to improve circulation, brighten the interior of the house, and improve access/visibility to the heavily wooded rear yard. A small two-story addition accommodates two new bathrooms and expanded kitchen. A shaft between the addition and existing structure brings light into the center of the house. 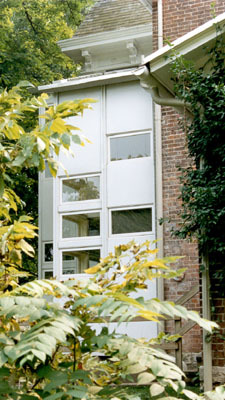 Steel casement windows form partitions which allow light to permeate the previously dark interior space. Large sections of walls were removed to bring light from the lightwell into adjacent spaces. An open-riser steel stairway traces upward in the lightwell in contrast to the heavy oak stairwell in the foyer. The strategy to clearly identify those elements which are new (by significant departures from the original) sets up many interesting contrasts and surprises. For example, the addition while not visible from the street, abruptly reveals itself as you walk along the driveway.